I only own a handful of skirts in my closet, and almost all of them are high-waisted. 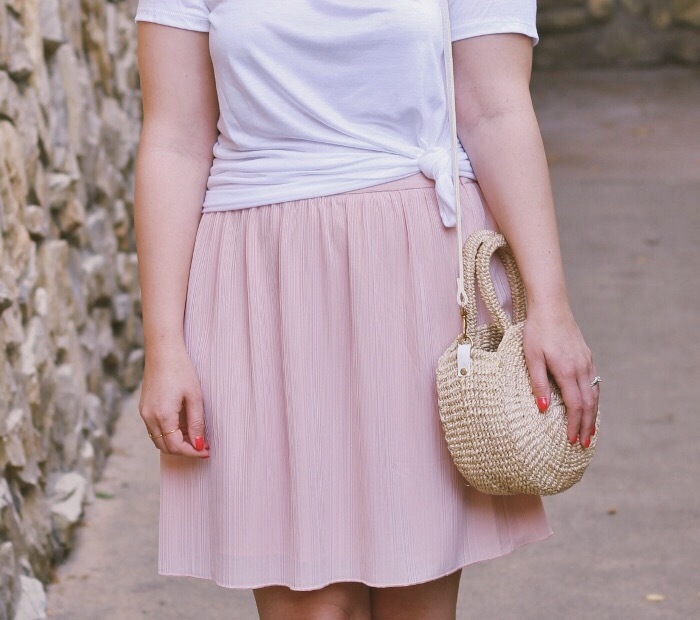 The one I'm wearing below is a fairly recent purchase from April, and the fit is so perfect that now I want everything that House of Harlow makes! It's fully lined, has a zipper on the side, and is the sweetest shade of pink. The only problem, how should I style it? My general rule for skirts is to pair them with a simple blouse, tucked in. This looks the most polished and proportional on most women. I tried a few options, but they all bunched up terribly, so I went for a white t-shirt instead and knotted it at the side. I loved the effect! The side knot gives the illusion of a tiny waist, and the ruching it creates is also slimming. Plus, no worries about adjusting my top throughout the day! I think it's perfect for casual Summer outfits, and now I want to try it with a maxi skirt I don't get enough use from. What do you think of the knot tee trend? It's probably on its way out and I'm just now getting it! Linking up with Rachelle and Carylee. I looove skirts and this one is so pretty. It will come handy on those hot summer days, how cute would it look with a loose tucked in v-neck tee. This is so cute! I just got a skirt very similar to this and am planning to try it with a white tee next. Love the sandals you paired with it as well! I have the same rule! I am trying to make my style less "blogger" and more realistic and simple is KEY! I have a similar lace skirt that I can't seem to get a top to work with. I need to try this option! It's really cute! I also love the affect! This was the perfect styling choice for your cute skirt. 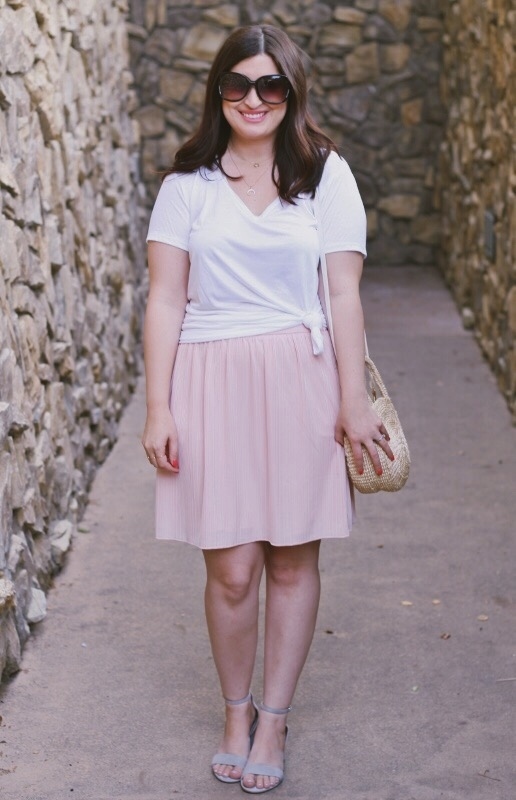 I love skirts but struggle to style them because nothing ever looks good tucked in on me. I love that you got creative with the knot! Right now I'm stocking up on bodysuits because they solve the tuck issues with the high waisted styles. Also sometimes a crop top will work too! Such a cute look dear! 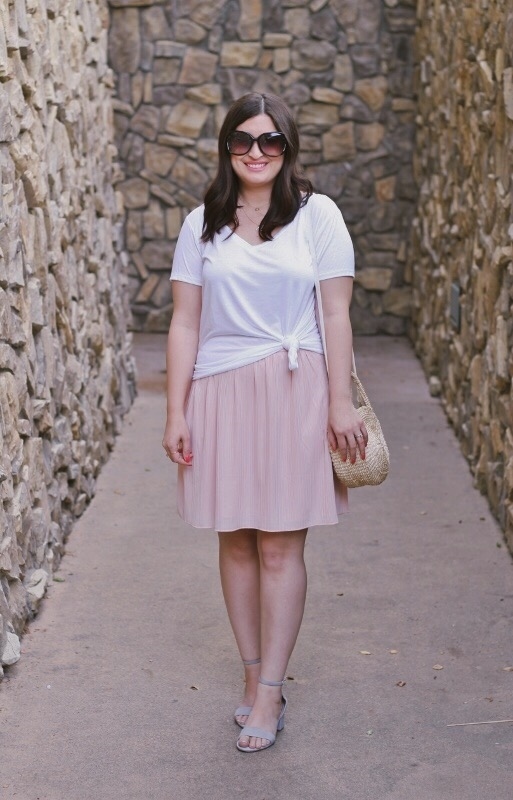 I love knotted tees, they make basic tee look extra chic. Also, cute pastel skirt you got there, really perfect for the white top.